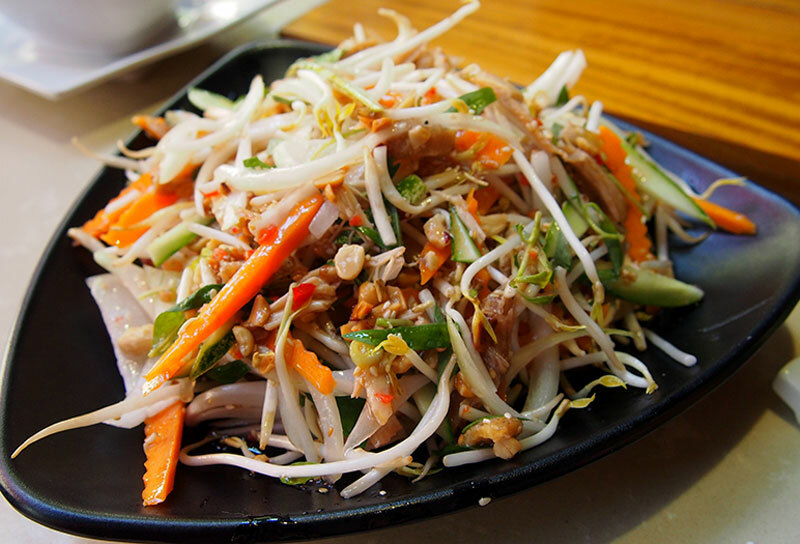 Vietnam has an abundance of healthy, incredibly delicious dishes. It seems like everywhere we turn we find another healthy travel find dish. I really love the Ga Xe Phay and have it every chance I get. I have also seen it referred to ask Goi Ga, at east, I believe they are the same. This is the perfect summer dish, it is light and healthy but very filling. It is tangy, it is sweet, it is refreshing. In short, it hits every requirement I have for a dish. Like every other dish, it seems that there are adaptations and even personal preference adaptations. No matter how you make it, it is a must try dish, not only because it tastes delicious, but also because it is packed with full of vegetables! Here are a few of the common denominator ingredients that most versions seem to have and the health benefits each are associated with. Poached Chicken– Chicken is a great source of protein and is lower in saturated fat than other kinds of protein. Poached, it becomes juicy and flavorful and the meat practically falls off the bone! Cabbage– Classified as a cruciferous vegetable, cabbage is rich in sulfur containing compounds called glucosinates. The glucosinates impart that pungent, maybe even a little spicy flavor and set cruciferous vegetables apart from other vegetables as exceptionally good for you. The glucosinates have been shown to decrease lung and colorectal cancer risk. Everything you ever wanted to know about them is HERE. Carrot– the name beta-carotene comes from carrots, so it should be no surprise that carrots are a great source of this powerful antioxidant. Beta-carotene may lower the risk of cardiovascular disease and some cancers. Simply taking supplements doesn’t show the same result, so be sure and get your beta-carotene through food! Red Onion– The same aroma that brings tears to your eyes also helps reduce the risk of some chronic diseases, it comes from the organosulfur compounds that act as powerful antioxidants. Red onions specifically get their color from flavonoids which may help reduce blood pressure and risk of stroke, and heart disease. Onions are also a good source of vitamins A, C, E and folic acid. Cilantro– High in vision boosting vitamin A and full of antibacterial properties (meaning it protects against bacterial growth), cilantro is also very low in sodium and a great way to add flavor without adding calories, sodium or fat. Mint– Strong antibacterial activity, high in free radical destroying antioxidants and generally helps aid digestion my reducing dyspepsia and indigestion. Peanuts– A good source of plant sterols, which help reduce the risk of cardiovascular disease by lowering serum LDL (bad) cholesterol levels. Shallot– Like onions, shallots are high in flavonoids which may help decrease the risk of cancer, heart disease and diabetes. They originated in China and are a good source of potassium, folate and vitamin A.
Bird’s Eye Chili– The capsaicin is not only responsible for that intense burn, but it is also responsible for the ensuing endorphin rush to block the heat which the body interprets as pain. Chilis are also good sources of flavonoids and carotenoids that may help reduce the risk of prostate cancer. Fish Sauce– Adds flavorful, salty, fishy taste. High in sodium, so use in moderation. Looking for a good fish sauce? Our Daily Brine did a taste test of the top brands, find out which fish sauce was the best HERE. Lime Juice– A great flavor enhancer and source of vitamin C, limes boost the immune system prevents scurvy (not much of a risk for that these days, but you never know!) and has antioxidant and antibacterial properties. Vinegar– Interesting new research is showing that vinegar can help mitigate the effects of a high starch meal and keep blood sugar levels from spiking after a meal. The acetic acid in vinegar has been attributed to a reduction in starch digestion, the undigested starch then goes on to feed the healthy bacteria in the gut. Fun Fact: Often times the broth that the chicken is poached in is used to make congee, a sort of rice soup with green onions, shallots, chicken and cilantro that often accompanies Ga Xe Phay. Broth is a surprisingly good source of usable calcium for the body, so definitely do not throw it out- use it for congee or another favorite soup recipe! Refreshing, delicious and super nutritious- what are you waiting for?!?! Try one of the recipes below and let your tastebuds take you through the streets of Vietnam with me! Denise and Lenny describe this salad as “light and very refreshing” They use leftover chicken breasts for added convenience! Lan uses rotisserie chicken to make her salad super easy and healthy! She no longer blogs at Angry Asian Creations, instead visit her HERE.